"It doesn't matter what you believe if you don't exist." I certainly never set out to do this, but in my time on this planet I have managed to see five different movies about its impending destruction by comet, meteor or other inanimate extraterrestrial threat. Tycus is the latest in this sub-genre, made for video in 1998, though it apparently didn't find a distributor until the year 2000. This time around, the impending threat is the titular Tycus, a comet spotted six years earlier by astronomer Peter Crawford (Dennis Hopper), whose discovery was ignored by his scientist peers. Using the Amtorg Mining Company as a front, Crawford obtained a nuclear warhead, intended to destroy or impede the approaching comet, and launched Project Archangel, a backup plan involving an underground compound housing enough people to restore human civilization. Journalist Jake Lowe (Peter Onorati) stumbles onto the project and infiltrates the facility, where he earns a chance to save his wife Amy (Finola Hughes) and their unborn child. Tycus is a typical made-for-video action/sci-fi movie, replete with cardboard characterizations, plot holes, and middling special effects. Nobody involved seems to care much about the project—one gets the impression that the actors showed up, glanced at the day's script, did a take or two and went home. Dennis Hopper (in a rare sympathetic role) walks through his performance with naked indifference, shielded only by a salt-and-pepper beard and a perpetual deer-in-the-headlights expression. Finola Hughes looks great but is given little to do, and Peter Onorati has the thankless job of making Jake Lowe likable, a near-impossible task given the character's impulsiveness, thoughtlessness and obstinate ignorance. The "dramatic" confrontations between Lowe and Crawford never build up much steam, because Lowe's accusations hold little water—he claims Crawford is "playing God" by limiting the facility's occupancy to what it can support, ignoring the fact that very few people would survive at all without Crawford's efforts. 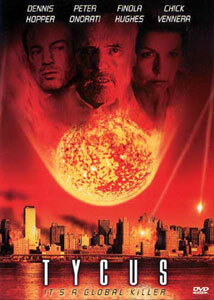 The script has numerous flaws—we're asked to believe that no one else has spotted this threat until it's within a few hours of striking the Earth, that Amtorg Mining Company's in-house astronomy facility surpasses every other installation on the planet, and that the comet just happens to impact Earth's moon dead center. And because the entire story is framed as a flashback from an idyllic, arboreal post-disaster world, its outcome is never truly in doubt. If Lowe's persistently wrongheaded thinking is meant to be ironic, it's never made clear—without a genuine evil to rail against, he's left fighting nobody at all, as if he started an Internet "flame war" and nobody bothered to return fire. Tycus features some halfway decent CGI special effects depicting the comet's impact, though the compositing leaves much to be desired. Comet trails use standard particle system plug-ins seen in many other low-budget efforts, with off-the-shelf explosions layered onto stock footage of varying quality. These shots also seem a bit disconnected from the body of the film, since no major characters are seen during the effects sequences. Of course, the special effects' shortcomings wouldn't be quite so obvious if the entire "destruction" sequence were not repeated TWICE in the course of the film, with nary an editing change or alternate camera angle. Image Transfer Review: Paramount presents Tycus in its original made-for-cable 1.33:1 full-frame aspect ratio. The digital transfer seems to have been taken from a broadcast-quality videotape master—it suffers from smeariness in grass and trees, murky shadow detail, abundant moire effects and quite a bit of edge enhancement, though color is well-represented. The movie was probably shot on film but edited on video, fundamentally limiting its visual quality; in any case, this is not up to contemporary DVD standards. Audio Transfer Review: Tycus features two Dolby Digital audio tracks, a 5.1 track and a 2.0 surround track. The 5.1 track is slightly cleaner than the 2.0 edition, with at least one instance of split-surround usage. Both tracks are otherwise similar, with dialogue and most sound effects centered and the film's generic orchestral score occupying the surrounds. The soundtrack has a fairly solid "presence" given its low-budget origins, but bass is MUCH weaker than it ought to be and there's nothing remarkable here. A standard made-for-video full-frame trailer, emphasizing the special effects. Well-written, substantial biographies and comprehensive filmographies for 8 cast members and 5 crew members. Director John Putch contributes a running screen-specific commentary. It's not a very exciting track—one gets the impression that this film was "just a job" from his workmanlike discussion of locations, effects and actors. It's nice to see a commentary on a minor release like this, but Putch displays little pride in the film and seems hard-pressed to come up with anything funny or informative, though he does mention most of the films Tycus imitates. Tycus is exactly what it tries to be—an unambitious disaster film rushed into production to capitalize on publicity surrounding more expensive endangered-Earth movies. Paramount's DVD release is competent given the nature of the production, but there's nothing fresh, exciting or even very interesting about Tycus. Not recommended.